I wore this casual, cozy ensemble running errands when I returned from Utah last weekend – I came back from frigid temps to still very cold weather, so my Iris & Ink coat from London definitely came in handy! 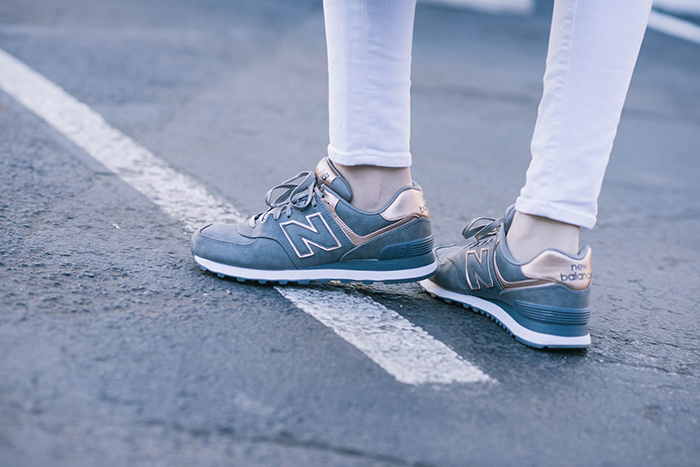 As I mentioned last week, I recently picked up this pair of grey + rose gold New Balance sneakers. They’re perfect for everyday activities, errands, etc and don’t make me feel like I’m wearing workout clothes 24/7, because they are much cuter than my legitimate running shoes. The grey pairs well with my J.Crew sweater, which I picked up at the beginning of fall. I kind of can’t believe it’s taken me so long to feature this sweater on here. I’ve worn it all season long! While simplifying my closet with basics and year-round neutrals is one of my goals for 2015, so is making the effort to look put together every day. I have to confess that since quitting my full-time job just over a year ago, I’ve been having difficulty forcing myself to get ready and look presentable every day. It’s just so easy to throw on my lululemons and not put on makeup! It takes just as much effort to put on my lululemon pants as it does to throw on a cute, casual outfit like this, so we’ll see how well I do! What are some of your goals for 2015? Love these sneakers, so cute. 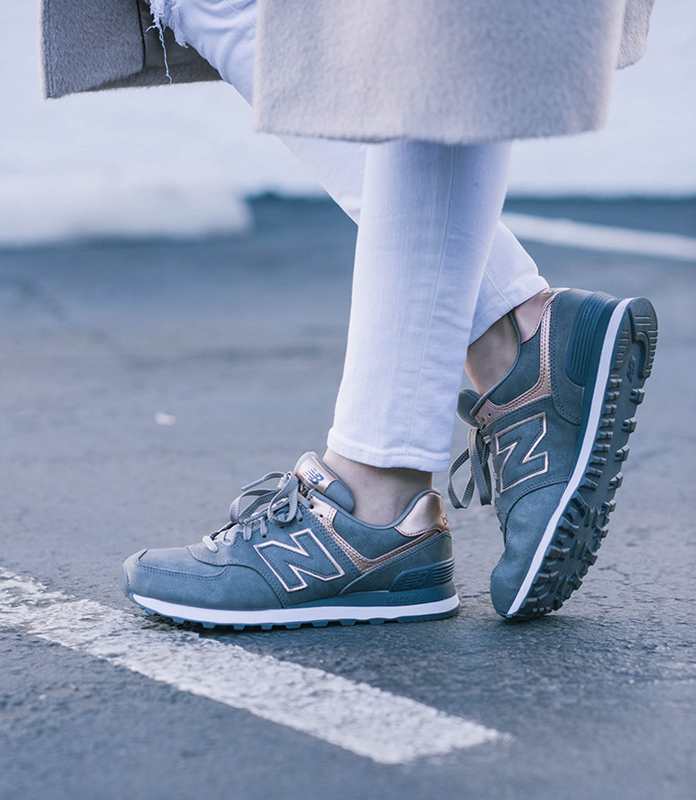 Love those new balance sneaks! I have a collection of sneakers just like them! Seriously, I’m so lazy on the weekends, especially when it’s freezing outside. It’s so much easier to throw on sweats and call it good! I love this casual outfit on you and those sneakers are too cute! I love every aspect of this outfit. And that coat – so great for dressing up or down! Soooooo obsessed with this look. Those sneaks are so cool! You are stunning and these photos are stunning. I love the colors in this look. Wish I was wearing it right now! I have never seen sneakers so glam, love! And that coat, amazing! Holy yes! This is such a great look. Love this effortless and easy weekend look. That coat looks sooo warm and cozy!! Loving the neutral, soft color palette here. Ha! You’re right, definitely takes just as long to put on cute clothes as it does your lulus! Something to be said about lulu but I love weekends so I can veer from my work attire with more casual clothes. Could wear denim daily. Love those sneaks! You nailed the grey monochrome look! Love the outfit but Iris and ink coat is to die for! Love it. I love that you paired sneakers with this look! 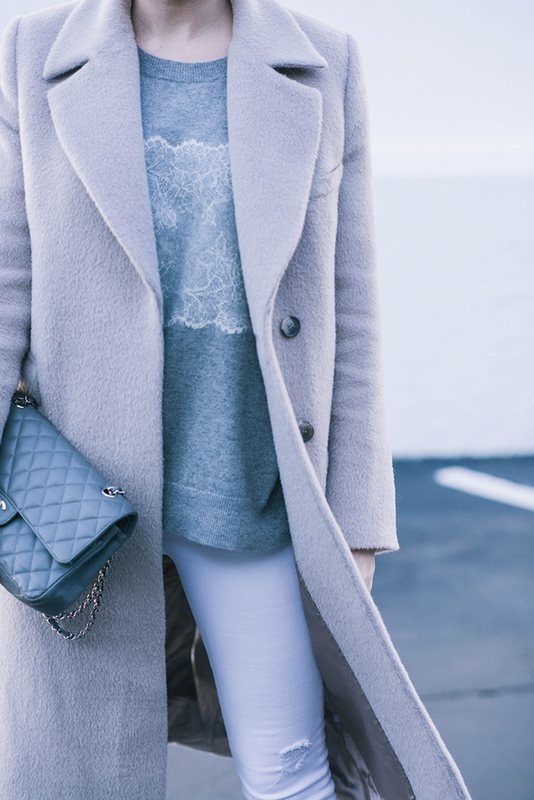 So chic yet comfy. I love this adorable outfit and you are so right about getting out of the Lululemons and into some jeans- as hard as it can be sometimes! You look fabulous. I love your sneakers! The touch of gold is perfect! I love how you styled these sneakers! So cool and classy at the same time. Love it! Love the sneakers, of course, since I have the same exact pair. I also love the way you paired them. What a perfect coat! You look so chic! New Balance are the best. Loving the gray and rose gold combo. You styled them perfectly! I would 100% wear this, and wear variations of it everyday! You are blowing my mind with this look! By far one of my favorites!!! SO effortlessly chic!! I am in desperate need of a pair of NB. I’ve been on a Nike kick lately but you’ve inspired me to pick up a pair of 574s! So good Merritt! Are the sneakers you are wearing the silver/rose gold or charcole/rose gold combo? It’s hard to tell from the photo. Thx!